Isabelle raised her eyes to the stucco ceiling gazing at the ornate light boss holding a dazzling chandelier. Her laughter tinkled lightly as she gazed at this man who could still surprise her. George’s attention was taken by the old fashioned mahogany bookcases that lined one wall of the lounge. He pointed them out to Isabelle who stood up to take a better look at the titles on the spines of the books. A leather bound Bible was prominently displayed on one of the bookcases. George groaned inwardly as he saw Isabelle’s hand take down this religious tome. She brought it back to the leather chesterfield sofa and as she sank low down in to the cushioned seating she opened the fly leaf of the book. ‘Oh look, George, there’s an inscription here. It’s a bit difficult to read as it’s slightly faded and in old fashioned script,’ said an awestruck Isabelle. ‘Wonderful,’ he heard himself say with a slight tinge of sarcasm. He poured their coffee dropping a cube of brown sugar into his black liquid whilst he picked up the jug of cream and slowly swirled it in to his beautiful wife’s cup. He heard a gasp and looked over to see Isabelle holding a black and white photograph in her hand. ‘Wow, look at this, George!’ she exclaimed. ‘It’s got to be pretty old. It must be to do with that chap who explored the Antarctic surely,’ she mused. ‘Let’s see,’ said George as he fumbled for his glasses from his shirt pocket. ‘It certainly looks pretty cold there,’ he said once the picture came in to focus. 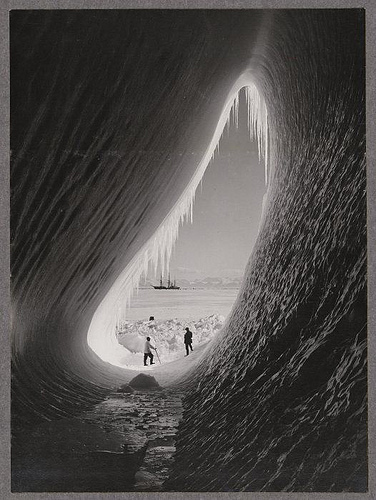 She turned the black and white photograph over and saw handwritten on the back the words: British Antarctic Expedition 5 January 1911. It wasn’t quite what he had in mind for the end of the evening when they retired to their four poster bed but he knew Isabelle would still be wondering if he didn't find out for her although he was almost sure she pretended to be more technophobic than she actually was. Ditto what jabblog said. ;) Nice work! A great picture to write to. This couple sounds sweet. I once heard that in many many movies a photograph or a painting is used to evoke memories for the characters or provide information the audience needs to better understand and appreciate the story. I thought of this as I read your story. I kept wondering how the photo was going to be used. Another great job, and way to keep it at 500 words! The title of your story is especially effective -- the multi-treats for Isabelle and the irony of no treat for George.